The airport is a transport hub and the third biggest after the London airports. Encouraged and allowed businesses and visitors to base themselves up north. Plans ahead include eco friendly building ideas. Create a large airport to cater for everyone in the north west. Turned a war time airport into a major commercial success. Build a world class airport to serve the north. Manchester is the third busiest airport in the UK after Gatwick and Heathrow. It handled a record 27.8 million passengers in 2017. Planes have been taking off and landing from the site since 1938. Originally called Ringway Airport after the nearby village, it was an RAF base during World War 2. Reverting to civilian use in peacetime, Manchester has expanded over the past 70 years and now covers an area of 1,400 acres. Manchester has 3 passenger terminals and 1 goods terminal. Its 2 runways are 3,200m and 3,048m long. This makes it the only other UK airport like Heathrow to operate 2 runways longer than 3,000m. Flights from Manchester go to 210 destinations around the globe. It's 13th in the world for the number of locations served. The airport is jointly owned by the 10 Greater Manchester councils – Manchester council has 55% with the other 9 local authorities holding 5% each. Future plans include the construction of Airport City Manchester. This £800m project will see new offices, shops and hotels built on a site next to the airport. Manchester airport opened in June 1938 and is currently the UK's largest airport outside of London. 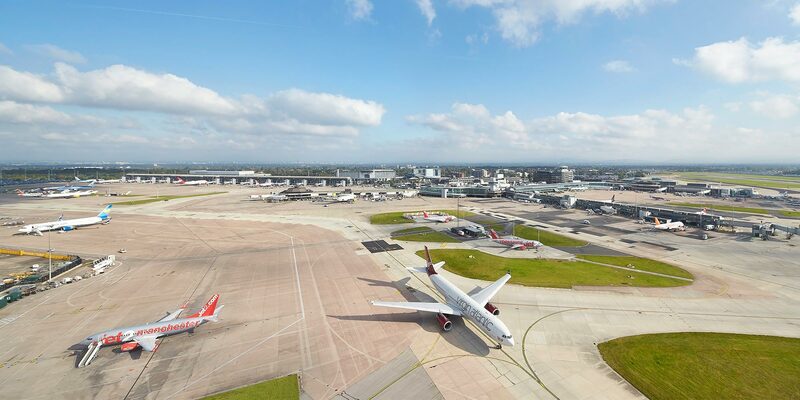 The £1bn Manchester Airport transformation project is currently under way to turn Manchester airport and the surrounding areas into the most modern and customer service focused airport in Europe. An average 74,000 people fly in or out of Manchester every day. The airport is an important hub for tourist and business travel in the north west of England. The airport is one of the biggest employers in the region with more than 22,200 people working there. It also supports an estimated 45,000 jobs in the region. Manchester Airport connects a large part of the UK with the rest of the world as 22 million people live within 2 hours of the terminal. Current construction work at Manchester Airport includes a £1bn overhaul of Terminal 2. The project will see the structure become the airport's primary terminal building. The work aims to increase its capacity from 8 to 25 million passengers a year. Opening in 1993 with 16 gates and 9 air bridges, Terminal 2 was designed to be expanded easily. The current scheme will see more gates installed as well as an improved road system to make access to the airport easier. Future work will see Terminals 2 and 3 eventually merged into a 'super-terminal'. Engineers working on the expansion have a built a temporary departure lounge while the new facilities are being constructed. The lounge aims to be as eco-friendly as possible – ceiling-high windows have been used to bring in plenty of natural light. The project team has also given the terminal its own power station. Generating both heat and power so that the station can conserve overall energy use and reduce pollution. Other improvements include a wider taxi-way for larger aircraft to pass each other and a carbon neutral terminal building. The UK's other hub airport. Transport Minister, at the launch of the Terminal 2 project in 2017. Manchester Airport has 254 check-in desks, over 500 toilets and 940 information screens. It also has 7 hotels and more than 120 shops and restaurants. Every year Manchester passengers drink around 1m pints of beer, eat 300,000 breakfasts and buy more than 3m hot drinks. The airport's shops sell over 1.5m bottles of water every year as well as 40,000 bottles of champagne, 1.8m books and more than 1m packs of cigarettes.